The future of tail light innovation today. BMW organic light OLED. In June 2014, BMW was the world’s first manufacturer to supply to customers a standard-production vehicle with laser lighting – the BMW i8. 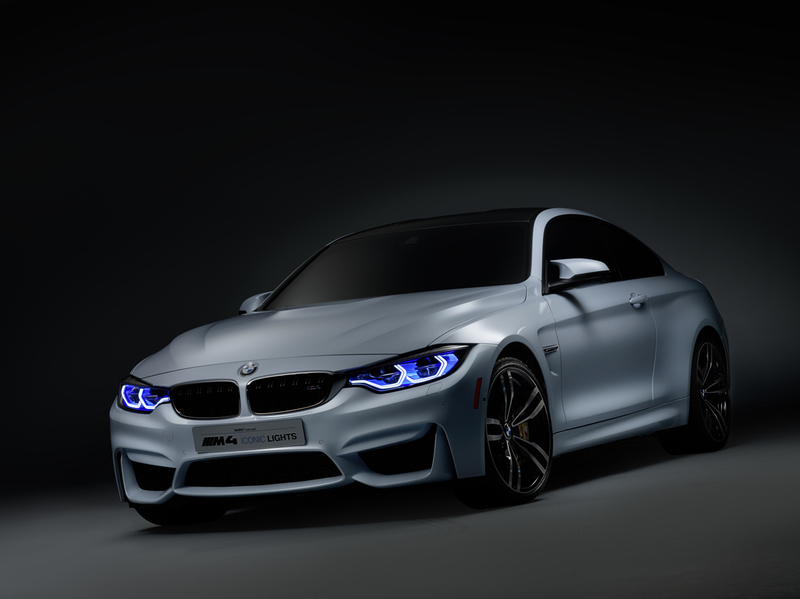 Equipped with intelligent laser lighting and OLED-based BMW Organic Light, the BMW M4 Concept Iconic Lights model on show at CES 2015 in Las Vegas highlights BMW’s position as a technology leader. The concept model combines pioneering lighting design with the latest technology. OLED-based BMW Organic Light uses elements which are just 1.4 millimetres thick. Their semiconducting layers of organic material produce light uniformly over their entire surface. In the past, legal requirements regulating the brightness of vehicle lighting have restricted the use of OLEDs on the exterior of the vehicle. However, with BMW M4 Concept Iconic Lights, rear light clusters have been developed which for the first time include not only OLED tail lights but also OLED direction indicators. Since the OLEDs can be activated individually, this creates new possibilities for using different styles of lighting at different times, for example in different driving modes. The front and rear lights of the BMW M4 Concept Iconic Lights model preview a number of lighting functions that can potentially be used in future production vehicles. Rear light clusters featuring BMW Organic Light will already be making their debut on a future vehicle of BMW M GmbH within the next 15 months. Discuss what BMW thinks will be the future of lighting technology. BMW laser lights offer an impressively long beam range well in excess of other lighting systems. The light is brighter, casts a concentrated beam over a distance of up to 600 metres and is extremely efficient. Upwards of a speed of 70 km/h (43.5 mph), BMW laser lights are automatically activated on top of the broader-dispersion LED main beam. 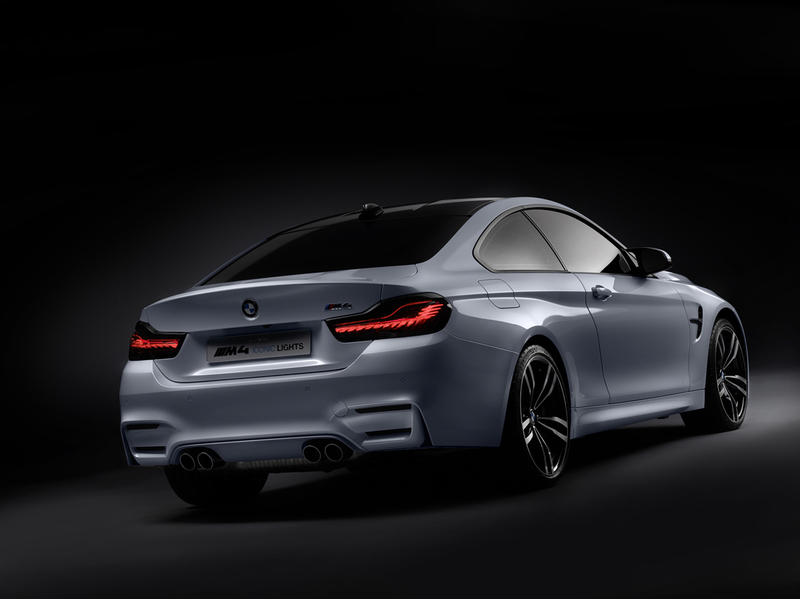 Innovations now being unveiled with BMW M4 Concept Iconic Lights are yet again helping BMW to widen its lead as a technology innovator. In combination with BMW Selective Beam, BMW laser lighting provides optimal vision without dazzling oncoming or preceding vehicles. Extensive integration between the headlights, camera, sensors and navigation systems is allowing new, proactive light functions to be developed. For example, if the vehicle sensors detect that the clear road width ahead is reduced, the laser beams can be activated to give drivers an indication of the width of their vehicle in relation to the road. BMW M4 Concept Iconic Lights also works with the navigation system to illuminate corners well in advance. The Dynamic Light Spot with laser technology detects people or animals on the road or at the roadside from a distance of up to 100 metres, and flashes to alert the driver.